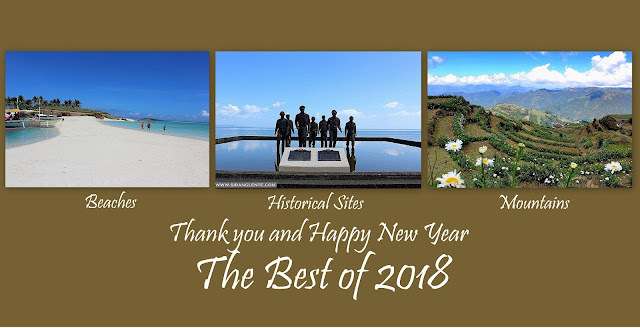 The Province of Quezon is one of my favorite provinces in the Philippines because of its gorgeous and stunning beaches that can be considered as on of the top tourist attractions and destinations in the region. Aside from that, they also have the colorful Pahiyas Festival and sumptuous pancit hab-hab. A few of the gems can also be found on higher altitude of Mt. Banahaw – the Holy Mountain and Mt. Cristobal – the Devils Mountain. Now, for the third time, I am visiting the three of the fine-looking islets of Padre Burgos, Quezon. This post is entitled: "Sana Alas Singko Nalang"
Alam kong nag-tatanong kayo kung bakit “Sana Alas Singko Nalang” ang titulo ng kwento ko ngayon, tama? Nanggaling po yan sa apat kong kasamahan dahil na-late ako sa aming tagpuan. Ang usapan, alas singko daw kami ng umaga magkikita-kita, pero dahil nag-upload pa ako ng blog spot ko na: Mt. Haponang Banoy at nag-laba pa ako, kaya ayun, yung alas-singko na kitaan, naging alis ko ng bahay. In short, hinusgahan nila ako dahil sa isang beses na pangyayaring iyon. An sakit-sakit kaya, kasi akala ko maiintindihan nila ang sitwasyon ko, pero nag-assume lang pala ako, na akala ko okay, pero hindi pala. At Jac Liner Bus terminal, we rode in a bus to Lucena Grand Terminal. Bus fare: 218 Pesos (might change without prior notice). Travel time was within 3-4 hours. At Lucena Grand Terminal, we rode in an ordinary bus and alighted in Lumang Karutom, Maraw, Padre Burgos, Quezon. Travel Time: almost 1 hour. Fare: 35 Pesos. Then, 15-20 minutes boat ride to Dampalitan and Borawan Island. After getting off the boat, we proceeded to the spot for pitching our tent. Then, after settling our things inside the tent, we walked on the fine white sand beach while sun was striking. The weather was unpredictable; the blue skies were easily covered with gray clouds and the waves became stronger. Before the rain started, we proceeded to our first destination. Our first stop was Puting Buhangin, an hour boat ride from Dampalitan. Waves were huge and strong making our experience remarkable. Palagi naman talagang ganun diba? Napakarami tayong mga balakid na hinaharap araw-araw; sa una mahirap talaga pero darating din ang panahon na makakaya natin ang mga problemang yan. Pero minsan naiisip ko: “napagtatagumpayan ko ba talaga ang mga balakid na ito? O sadyang nasanay na ang puso at isipan ko, kaya nagmumukhang madali harapin ang mga ito.” Anyways, Puting Buhangin are Filipino words which literally translate to “white sand”. The shore is maybe 200 meters long, with fine white sand and is comparable to Boracay Island. At the end of the stretch of fine white sand is a cave, by the water. Locals call it Kwebang Lampas which is an additional attraction (photo above) in the area. Entrance Fee: 80 pesos per head, day tour. Its dome measures 10 meters, maybe, from the ground. The walls are covered with brilliant green-ish and gray-ish color. There are also shades of brown-ish on boulder’s surface. You know what’s brown-ish is? Yun yung parang cake na nabibili ng tiglilimang piso sa bakery na kulay brown. Next, we proceeded to Borawan Island. It’s 30 to 40 minutes travel from Puting Buhangin. Entrance Fee: 150 pesos per head, day tour. Borawan have changed. In 2013, it was still almost untouched and simple, check my older photos here: Borawan Island. Today, owner turned it to commercial island resort. But its natural beauty remains. There are cottages and tents for rent and sari-sari store. The rock formations are comparable to the rocks of Coron, Palawan. The air was cool and relaxing; the water is crystal clear and has fine white sand beaches. We stayed in Borawan for an hour and went back to Dampalitan. Around 6PM when we arrived in Dampalitan. We were astounded by the brilliant color of the sunset, so while there’s sun light, we started preparing our dinner. At syempre, hindi mawawala ang mga hugot lines namin habang nag-luluto dahil naniniwala kami na pag-katapos ng gabi, hindi mawawala ang umaga, diba? May masabi lang. Photo captured using my Olympus Tough. Ito ang star ng aming gabi – ang grilled tuna. Dahil nga nagtitipid at hindi naman kami masyadong prepared sa lamyerda na ito, naisipan nalang naming mag-ihaw ng tuna. Gusto kasi naming malasahan ang pinagkaiba ng tuna dito sa Maynila at tuna na luto sa Quezon. Together with grilled tuna was salted egg, mixed with tomatoes and rice. After dinner, our original plan was to get drunk with a bonfire by the beach but it did not happen. Instead, after eating, we kept our utensils and laid down on the ground sheet and started counting the stars while citing stories. Since we don’t have a clock with us and we were all tired, we accidentally fell asleep while star gazing. The two girls were in the tent and we’re outside. Dampalitan Island offers tents and cottages for rent. Chasing the jelly in the water. Photo above is the proof for the clarity of the sea water in Quezon province. Another thing, what I can be proud of Quezon, aside from the fine white sand beaches and crystal clear waters are the gorgeous living organisms underwater. If you combine the clarity of the water and the gorgeous flora and fauna down under, it’s a paradise! Photo above is one of the types of the salabays or jellyfish scattered in the area. According to Jimboy, our boat man and a resident of Dampalitan, this month is the season where jellyfish migrates from one place to another because of the temperature change. The waters surrounding Dampalitan Island is pristine and crystal clear. The wave sounds very relaxing and the sky was clear. We dipped into the water and stayed by the shore for 4 hours, waiting to get tanned. For four hours, we’ve been talking about different things like political, socio-economic, biology, geography, showbiz chismis, love life and many things. We also talked about our next destination. We left Dampalitan at around 11AM. Had a boat ride to the mainland. In Maraw, we rode in a bus to Lucena Grand Terminal. Had our lunch and headed back to Manila. Our Quezon island hopping experience was remarkable. We were just few, but we have a lot of time to know ourselves better. On our next destination, I am positive that our friends will be with us. and Canon 1200D for other shots!